So, living here in Cow Country has taught me that a lot of the local cuisine is really not that great if you are diabetic or in a bariatric program. Everywhere you look, you find all sorts of compressed pig parts, carb-laden starchy goodness, breads, baked goods and candy. To say that the Pennsylvania Dutch really know how to make fattening food would be doing them a disservice. They are the kings of fat food. One of the hallmarks of the PA Dutch country is the smorgasbord. Sure, many people have seen Old Country Buffet, Duff’s Famous Smorgasbord, Cactus Willie’s, any of those places. Many have eaten at a casino buffet. They all have their places… I remember going to a joint in Florida during a high school band trip where the buffet came to you. You stood next to a giant round carousel of calories and the smorgasbord rotated past you. No worries about someone cutting in line ahead of you, that’s for sure. 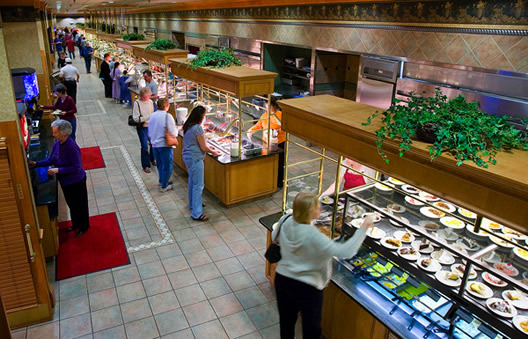 For us here at Chez T, the gold standard in buffet is Shady Maple Smorgasbord, located in East Earl, PA. The food is undistinguished… perhaps best described by Cookie, in the movie City Slickers, “You ain’t gonna get any nouveau, almondine, thin crust, bottled water, sauteed city food. 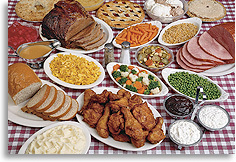 Food’s brown, hot, and plenty of it.” I naturally assumed that I had eaten my last broasted chicken and stuffing. Then I discovered that Shady Maple actually has discount pricing for post-bariatric patients. My first thought was, “Seriously? WTF?” If you check this link, you’ll see what I mean. Another gem in the culinary pantheon is Good n’ Plenty. This establishment is referred to by the local Disney nerds as “Amish ‘Ohana” because the food is served family style. The brown, hot and plenty of it rule applies here, too. I did not see any post-bariatric discounts, though, but again, this is a place I’m not really seeing as being in high post-op demand. They do have some amazing fried chicken, though. This one will be tougher to give up than Shady Maple, since this is one place our friends from New York like to visit when they are in the area. Other local establishments, such as Miller’s Smorgasbord, do not mention any kind of bariatric discount, which is probably a smart thing. I think that getting this type of major procedure done should also make folks reconsider their eating habits. I’m thinking that unbridled consumption helped get us here in the first place. If you want it to work, then maybe, just maybe, you might be better off at Saladworks. I recently had my annual physical examination, which I get once every seven years, and when the nurse weighed me, I was shocked to discover how much stronger the Earth’s gravitational pull has become since 1990.